With what looked like suspicious timing, Ai Weiwei, the CPC’s least favourite artist and political provocateur, had his application for a 6 month UK business visa refused by the British embassy in Beijing, due, the embassy said, to the artist not declaring his criminal convictions. Ai Weiwei hoped to be in the UK in September to install and open an exhibition at the Royal Academy in London – just before Xi Jin Ping arrived in the country in October for his first official visit. Having Ai Weiwei and the president of one of the UK’s most valuable trading partners in the country at the same time would be bound to cause unwanted tension, and so it appeared that the embassy was all too eager to oblige their guests by refusing Ai Weiwei full entry, and instead restricting him to just 20 days. The letter Ai Weiwei received from the embassy states: “it is a matter of public record that you have previously received a criminal conviction in China, and you have not declared this.” This undeclared ‘criminal conviction’ presumably refers to Ai Weiwei’s house arrests, firstly in November 2010 for ‘unspecified suspected crimes’ – in other words, because we don’t like you – and latterly in 2011, when he reappeared under house arrest 81 days after being arrested on April 3rd at Beijing Capital International Airport. This disappearance had been protested by the US, the EU, and various intellectuals and artists. The Chinese authorities said that Ai Weiwei had been arrested on suspicion of tax evasion and bigamy, though there were no charges, and he did not stand trial. That Ai Weiwei did not stand trial is also a matter of public record, of course, and, one would assume, quite well known. 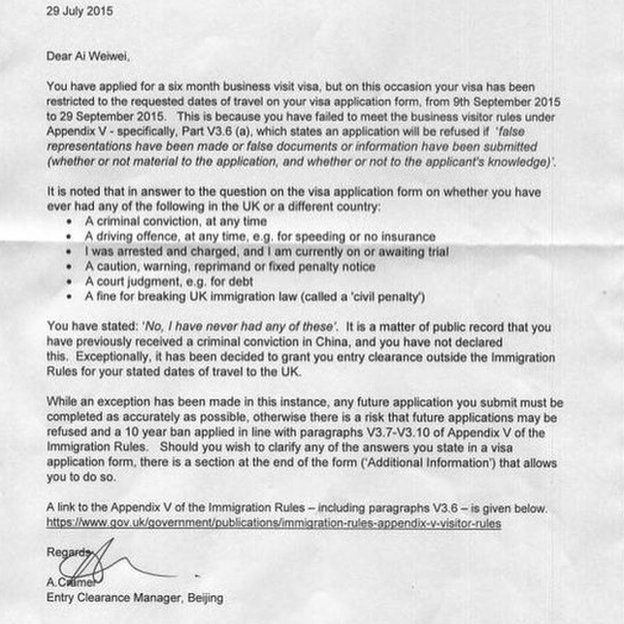 It has taken the intervention of Theresa May, the UK Home Secretary, for Ai Weiwei to be granted the full 6 month business visa that he originally applied for, after she personally wrote to him and overruled the UK embassy’s decision. Ai Weiwei will now be able to install and attend the opening of his exhibition – which means that he will be in the UK at the same time as Xi Jin Ping. His visa refusal could have been, of course, just a mistake on the behalf of the Entry Clearance Manager at the UK embassy in Beijing. Ai Weiwei’s arrests are well known, and the decision was eventually overturned. Justice, of a kind, was done. It is disappointing that a lapse in judgement on the behalf of the UK embassy would cause an outcry like this, even if it has turned out to be minor, though it is not easy to dismiss the notion that the original refusal and subsequent rejection of Ai Weiwei’s own personal appeals have more to do with politicking than with justice.